[S1033] Unknown volume, Copy of the Register of Baptisms in the Parish of Old Perlican District Bay de Verde (Newfoundland) 1816-1892., Provincial Archives of Newfoundland and Labrador, Confederation Building, St. John's, Newfoundland. [S1037] Gert Crosbie, compiler, Births, Deaths and Marriages in Newfoundland Newspapers. 1875-1877. (St. John's, NF: Gert Crosbie, May 1999). [S1052] D. Stan Vardy, "Descendants of Nicholas Vey," e-mail message from Vardy, D. Stan to David G. Ball, 28 Feb 2006. [S1036] W. Garrett, Cemetery Headstone Transcripts, Long Beach, Southwest Arm, Church of England Cemetery (St. John's, NF: Newfoundland and Labrador Genealogical Society, Inc., 1991). Hereinafter cited as Long Beach, NF CofE Cemetery. [S1039] Florence (Blundon) Cowan, compiler, Bay de Verde Anglican Church Records Including Grates Cove, Caplin Cove and Others. Baptisms 1841 - 1900, Marriages 1841 - 1893, Burials 1846 - 1900, Confirmations 1841 -1906. (St. John's, NF: n.pub., Transcribed 1992-1993). [S2431] "juhearn", "Original Family Tree (2012-07-22)," database made available on-line courtesy of "juhearn", http://trees.ancestry.ca/tree/48485850/person/12897713614?ssrc=, database viewed 5 November 2014. [S1060] Sandy MacEwen, "Descendants of William Baker - email 01," e-mail message from Sandy MacEwen (East Tawas MI) to David G. Ball, 14 March 2006. [S1058] Ed Barbour, "Vey Descendants of Michael Rice," e-mail message from Barbour, Ed to David G. Ball, 6 March 2006. [S1032] Unknown compiler, compiler, Return of Marriages for the Methodist (United church) Parish of Old Perlican Dating form 1816 - 1891 (n.p. : n.pub.). [S1038] Cemetery Marker (photo) of James Vey, Newfoundland Genealogical Society Library, St. John's, Newfoundland; David G. Ball, 36 Oct 2001. James Charles Vey was born on 1 October 1847 at Newfoundland; illegitimate. He was the son of James Rice and Eliza (????) 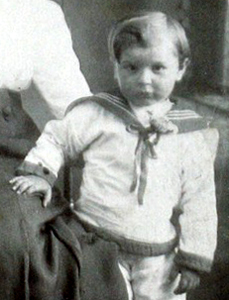 James Charles Vey was baptized on 20 June 1852 at Bay de Verde, Bay de Verde, Newfoundland. Alfred Vey was born circa 1844 at Grates Cove, Trinity Bay, Newfoundland.1 He was the son of James Rice and Lavinia Stoyles. Alfred Vey married Maria Day on 27 October 1871 at Grates Cove, Trinity Bay, Newfoundland. Maria Day married Alfred Vey, son of James Rice and Lavinia Stoyles, on 27 October 1871 at Grates Cove, Trinity Bay, Newfoundland. 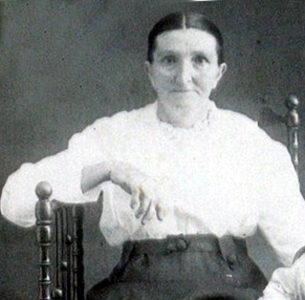 Sarah Puddister was born circa 1864 at Newfoundland. She was the daughter of John Puddister. Sarah Puddister married William James Vey, son of James Rice and Lavinia Stoyles, in 1886 at Grates Cove, Trinity Bay, Newfoundland. Sarah Puddister died on 6 September 1950 at NL, Canada; age 86. She was buried at Anglican Cemetery, Long Beach, Trinity Bay, Newfoundland. William Baker married Sarah Hayter. Sarah Hayter married William Baker. 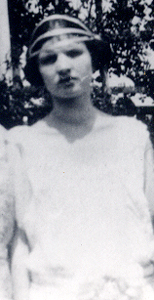 Rebecca Sarah Evans is the daughter of Harry Evans and Irene Jacobs. Kabin Andrew Wesley Thomas is the son of Kabin Thomas and Denise Dawne Elizabeth Truog. Olga Lea Bennett was also known as Kay. Photo courtesy of David G. Ball of North Vancouver BC Canada. [S13] 1910 (April 15) U.S. Census, Union, Mercer Co., OH, ED 123, Sheet 4A (stamped 256). [S14] 1920 (January 1) U.S. Census, Middletown, Butler Co., OH, ED 60, Sheet 10A (stamped 165). [S15] 1930 (April 1) U.S. Census, Casper, Natrona Co., WY, ED 13-7, Sheet 3B (back of stamped 83). [S16] 1940 (April 1) U.S. Census, Denver, Denver Co., CO, ED 16-77A, Sheet 6B (back of stamped 6). [S2117] D. J. Pearson, "Lund Family Tree," database made available on-line courtesy of D. J. Pearson, http://trees.ancestry.ca/tree/1407344/person/-1946586019, database put on-line September 2013. [S8] 1860 (June 1) U.S. Census, Cabot, Washington Co., VT, p. 276 (back of stamped 3). [S9] 1870 (June 1) U.S. Census, Peacham, Caledonia Co., VT, p. 14 (back of stamped 150). [S8] 1860 (June 1) U.S. Census, Calais, Washington Co., VT, p. 265 (stamped 32). [S10] 1880 (June 1) U.S. Census, Peacham, Caledonia Co., VT, ED 50, p. 17 (stamped 129). [S13] 1910 (April 15) U.S. Census, Worcester, Worcester Co., MA, ED 1850, Sheet 13A (stamped 13). Emmaroy Caria Slayton married Henry Carlton Hitchcock, son of Luther Wheatley Hitchcock and Lillias Mariah Dunbar, on 5 September 1865 at Cabot, Washington Co., VT.